The plane leaves Harbour Terminal in Vancouver. Thick cloud banks hung in the sky the morning we took off from Harbour Terminal on the waterfront of Vancouver, British Columbia. Reggie, our Harbour Air pilot, wasn’t sure if he could fly the floatplane through the dense clouds or if we would have to go around. But it was our lucky day—Reggie managed to find enough openings to give us a spectacular ride. We were headed to Whistler for a day of golf at The Fairmont Chateau Whistler course. Since there were only three passengers (and Reggie’s bicycle) in the small plane, he invited me to ride in the co-pilot seat. From this front row vantage point I had excellent views of the mountains, trees, and rivers below. We fly above clouds and close to the mountains. Flying over steep Girabaldi Mountain, an inactive volcano with occasional small lava flows, provided spectacular scenery. Reggie pointed out the Lions, two mountain peaks that protruded through the clouds even though we were flying at almost 8,000 feet altitude. 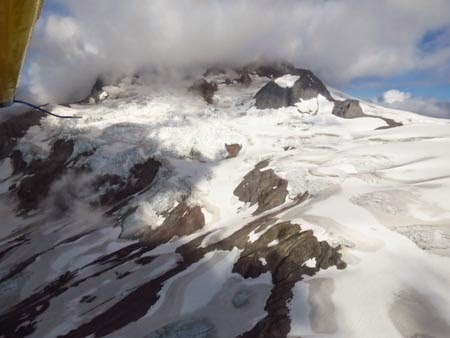 Ice from glaciers and packed snow on the mountains reminded us of a winter wonderland on this warm August day. And then there was Girabaldi Lake, a beautiful creamy blue-green alpine lake whose color is a result of rock flour (pieces of rock and dirt) moved by the glacier into the lake. Other colors of the prism are absorbed by the water and air, leaving only blue and green reflected. 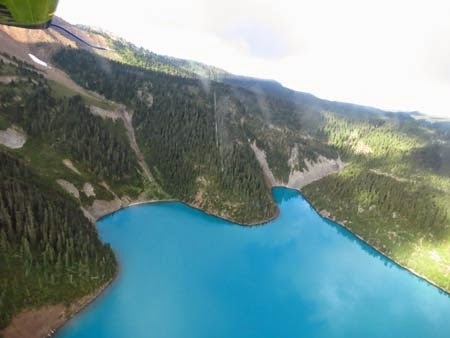 Giralbaldi Lake forms a spectacular scene from the air. 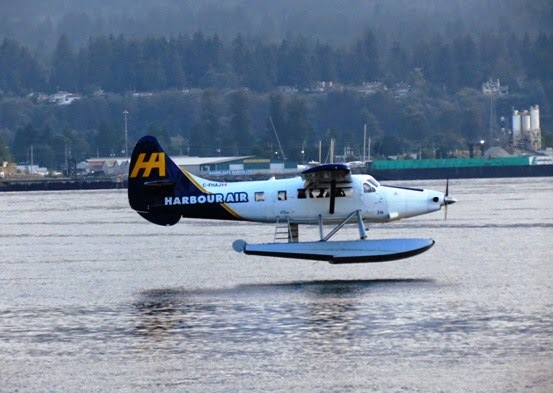 Started in 1982, Harbor Float Planes take guests to remote spots for fishing, camping, or on sightseeing excursions. 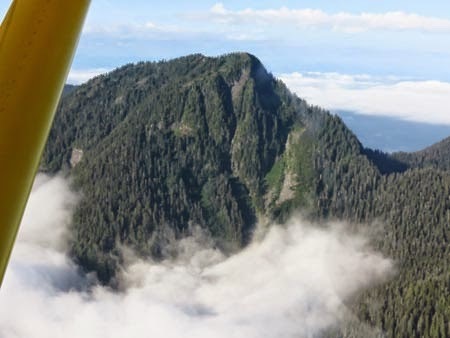 Flights to Vancouver Island, whale watching, along the west coast, and other scenic routes are available. 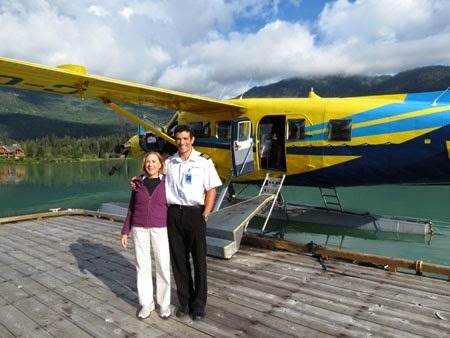 Guests going to Whistler can fly round trip or combine the sea plane experience with a train or bus ride one way. 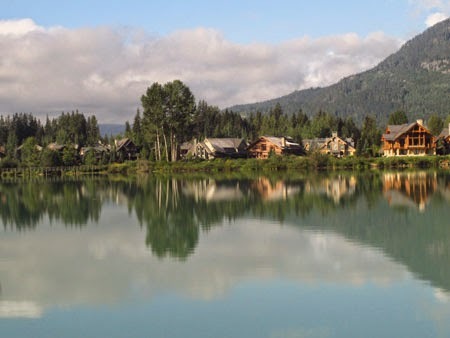 Included is a shuttle to Whistler’s famous Village, packed with shops and restaurants, or bike rental so you can meander on your own. Reflections from our landing on Green Lake at Whister. Our flight was thrilling despite the thick clouds (or because of them). Stunning panoramas floated just under the plane’s wings almost the entire journey. As we approached Whistler, Reggie expertly guided the plane into a smooth landing on Green Lake, a short ride from the golf course. Beverly poses with the pilot Reggie after landing at Whistler. 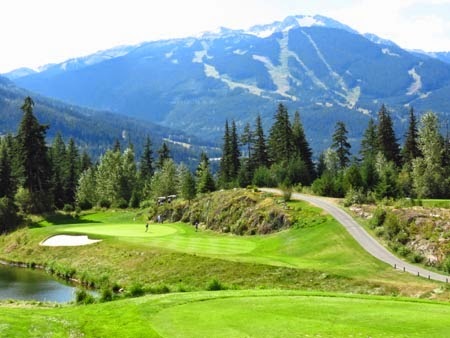 Although it’s not such a long course, mountainous conditions made playing golf at Fairmont Chateau Whistler quite challenging. Many bunkers guard fairways as well as greens. If your ball goes into the forest, down a hill, or in a gulley, it likely won’t be found again. So the course has instituted a one-minute rule to search for a lost ball. Chateau Whistler golf course. Who cares how well you play? Bears had been spotted on the course in May, when they came out of hibernation, but the mid-70s temperature that day was too warm for bears to be roaming around. Despite the bunkers, fast greens, and numerous gulleys to hit over, the course was in excellent condition with gorgeous mountain scenery all around. It was the kind of day everyone dreams of--just perfect.